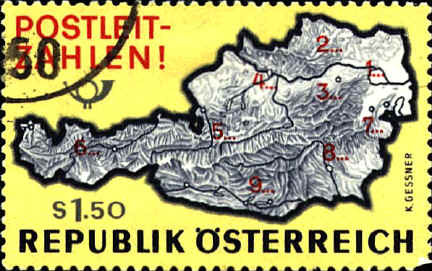 D. E. G. Irvine and M Seshold, Errors in Postage Stamp Design, 1979, p. 81. wrote "An Austrian 1s.50 stamp of 1966 shows a map of Austria divided into its postal zones, but the boundary between postal zones two and three, on the map shown as the Danube, in fact lies north of the Danube." Actually, the line between zone 2 and 3 is the Danube, but it is not the boundary between the two postal zones. The lines on the map are rivers. Zones 3, 7 and 8 have no rivers between them on the map, so there are no lines to confuse as boundaries between these three zones. The same is true with zones 4 and 5. Irvine and Seshold go on, "Furthermore the stamp show the Krimmler Ache...as the Salznach. The Salznach itself rises on the Sazachgeir, which is situated on the Gerlosplatte." Comparing the stamp with a map of Austria I can find no evidence to support this statement.